A new release from Pragmatic Play, Ancient Egypt Classic covers well-trodden ground with their take on the ever-popular Ancient Egypt theme initially made popular by Novomatic’s now 13-year-old classic, Book of Ra. As with Ra and its many clones, Ancient Egypt Classic offers a free spin bonus round and is a high variance slot with 10 fixed pay lines on a 5x3 reel board. 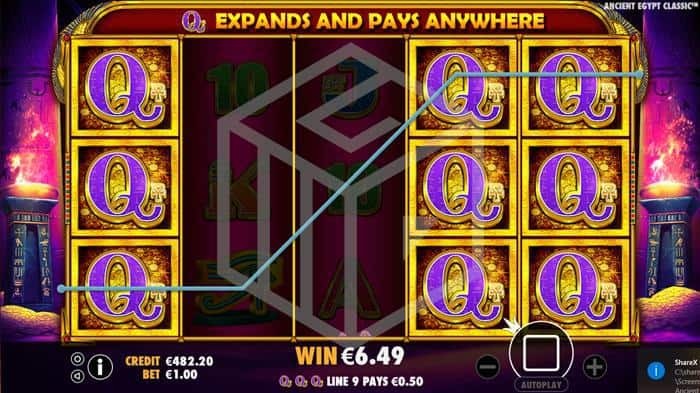 It benefits from a slightly higher ROI than most of its fellow Pharoah & Sphinx counterparts at 96.47% and offers spins from just €0.10 up to €50 a go. Once again there will be no great surprises in the Ancient Egyptian design with Ancient Egypt Classic. The background is of the inside of a pyramid at the entrance of a pharaoh’s tomb flanked either side by large stone pillars etched with hieroglyphic carvings, each with a flaming torch in front of them. The soundtrack is suitably other-worldly, Egyptian and slightly spooky, just like I imagine the entrance to an ancient Egyptian tomb probably would be! The zero-surprise factor continues with the design of the symbols. 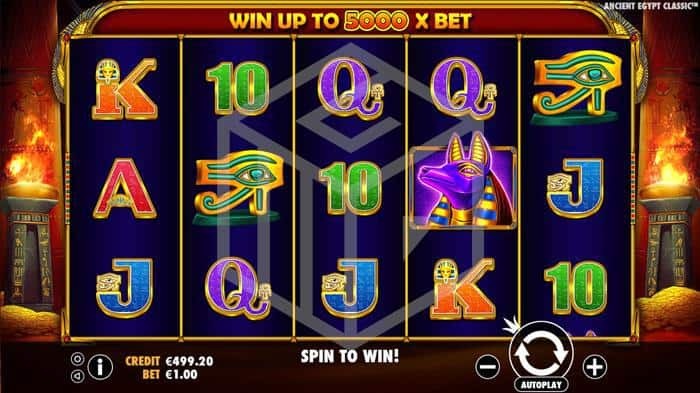 10 through to Ace make up the lower value symbols while the higher values are represented by The Eye of Horus, Ankh cross, Anubis, and Cleopatra – all of which will be familiar with ancient Egypt themed slots. Cleopatra is the highest paying symbol and you can win 500x the bet size for landing five on a pay line. The wild, which doubles as the scatter symbol is of a Golden Scarab which pays 200x the bet size for five on a pay line but more importantly sends you to the elusive free spin round if you manage to land three of more on the game board. 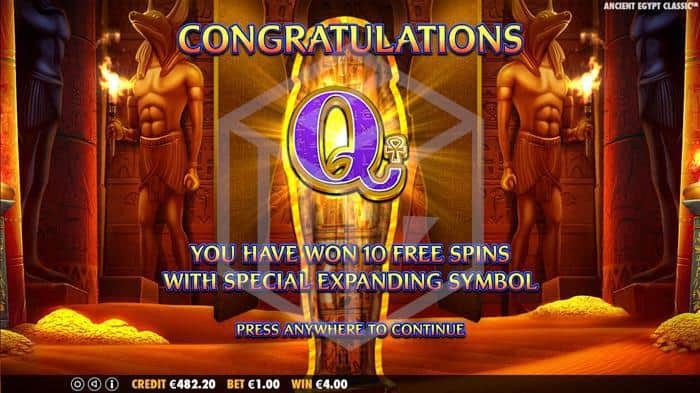 As with your average high volatility slot, Ancient Egypt Classic players will be relying on landing those Scarabs to enter the free spin round if they want to make some real money. Landing 3 will see you enter the bonus round with 10 free spins. Anyone familiar with these slots will know that before the spins start one of the standard symbols will be chosen to act as a “Special Symbol” which will expand to cover the entire reel if enough land to trigger a win, although with the special symbol they don’t necessarily have to land on adjacent reels. For example, if your special symbol is the Q then as long as 3 Q’s land on 3 separate reels they will all expand and you’ll be paid as if you have landed a 3x3 block of Q’s. The minimum to activate the expanding reels are 2 for the premium symbols and 3 for the lower value symbols. During the bonus round if you manage to land 5 Cleopatra symbols on the 5 reels then you’ll hit the maximum win of 5,000x the bet size. It is possible to retrigger the free spins indefinitely by landing 3 or more scarabs during your 10 spins. If you retrigger the free spine then you must first play out your current 10 spins whereupon 10 new spins will start with a brand new special symbol special symbol. As previously mentioned (quite a bit) there is nothing new here, just Pragmatic Play getting in on the Egyptian action, producing a nice looking (if not spectacular) version of Book of Ra. This is no bad thing, however, if it’s worked for other providers then there’s no reason it won’t work for Pragmatic – players like a high volatility slot, and they like the ancient Egyptian theme. You know what they say, ‘if it ain’t broke, don’t fix it’ and Pragmatic Play are happy to leave this formula well enough alone and will be hoping to reap the benefits.